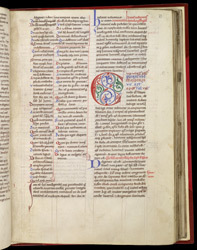 Of the writings of Peter Lombard (born in Lombardy c. 1100, died as archbishop of Paris in 1160) the most famous was his 'Sentences', a systematic compendium of theology in four books. Sections of the 'Sentences' begin with chapter lists (a kind of table of contents for the section), a series of titles and prologues, and then finally the first chapter. The chapter lists for this section are quite confusingly written in two narrow columns, but it seems a mistake was made in laying out the chapter titles. The red line separates a section at the top of the 2nd column, while that below the line continues the lists from the end of the 1st column. Even reading the table of contents could be challenging.